Apart from that I’ve been busy with preparations for my second internship at a retirement home. Our class went to a nurse college this week. Everything was quite ‘boring’ – I already knew everything we learnt there and after some time all the teachers ignored me because I knew all the correct answers- but still quite some fun. The internship itself starts on Monday and will go for 2 weeks. Then I’m back at school and then for another 3 weeks at the retirement home. Back to blog business. There were some topics I wanted to write about lately, but somehow I never found the time or marked them as not that important anyway. Let’s get to the point of this post. 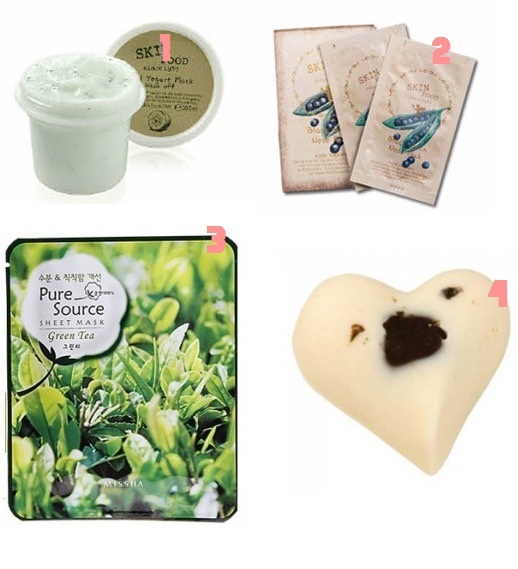 Lately, I’ve been following lots of beauty blogs (Memorable Days, Yuklui Style and fellow WP Peach Milky Tea are my favorites) and some online stores which carry asian beauty products. It took me a while to decide which to buy, since it is SO OVERWHELMING. Really. I mostly looked up products on ebay and felt the need to buy lots of stuff. Like, I would think ‘Of course I need a mask for colored hair, I’m gonna dye my hair back to chestnut soon!’ and stuff like that… Haha I’m so easy to manipulate! Well in the end I bought mainly facial stuff. ‘Cause yeah I felt like this would be best? Try some of this, move on to hair products and build up a stock of my favorite products. That’s the plan. Now I have to say I’m not really a beauty crack – I hardly did masks before (I was lazy like ‘Won’t use anything anway’) but now I’m hooked up! I used to buy Dead Sea Masks, but ever since I read that this is one of the reasons for the Dead Sea to dry I stopped buying them. I also told my mother not to buy Dead Sea bathsalts anymore but she just said ‘Well, it’s dead already!’ Oh mum. Sigh. 1: Kiwi/Papaya Yoghurt Mask by SKINFOOD – These are my latest buys. I absolutely love them! The smell, the texture, the results on my face – just perfect! I prefer the Kiwi one though, because its smell is better. 2: Black Bean Nose Pore Strips by SKINFOOD – Pore Strips are always a smart investment and these are the best I’ve ever tried! Although I’ve heard some people complain about its smell, I like them a lot! Just try them and if you don’t like it, there are like a million other products. 3: Green Tea/Lemon/Pearl Pure Source Sheet Mask by MISSHA – These sheet masks have been like an epiphany. My face has never been more moisturized and bright. Plus I used them when I had a cold and it made my puffy cheeks vanish (and I felt instantly better. I have no idea why though)! My favorites were the Green Tea masks so far. I didn’t like the Pearl masks that much because it made my skin a bit itchy. 4: Soft Coeur Massage Butter by Lush – I’ve had this one over a year (box full of lush products from my uncle and aunt for my birthday!) but I only got to appreciate it now during winter. Not only is it nice to be massaged with it, but it also did a lot for my skin! It has Cacao butter, Shea Butter, honey, Cacao powder, Lime oil and lots of other great oils in it. That’s why I use it at least twice a week. It makes your skin very soft, moisturized and very healthy. I bought everything except the Soft Coeur Massage Butter from this shop. With every purchase there I got a free Algae sheet mask. Weird thing is, it should’ve been two… But oh well, no complaints here. I just noticed how much I miss writing and blogging! Good thing is I have some ideas in stock. HAHA. By the way, do you want me to do reviews on Maison Faye? I think it’d be fun to try, but all the products I use have been reviewed like a thousand times (I always check reviews before buying this stuff) so it wouldn’t that interesting I guess? Let me know what you think! And if you have any products to recommend – Leave a message below! LUSH is one of my favorite beauty brands! I love their products. right? It was love at first sight. Lush will always be No.1-source when it comes to bathing salt or stuff like that! Dito! Hätte auch tausend ideen für meinen blog und vor lauter schule/ausbildung nicht dazu. Du sprichst mir aus der seele. man kommt einfach zu nichts. furchtbar.